Whilst we all take donning our runners and heading out bush as a given, it is intrinsically a dangerous sport. Many of us train alone on isolated tracks in the depths of winter or at the height of summer in remote areas with limited phone range and ever present dangers to bring us undone—snakes, slippery rocks, gnarly ground, kidney stones—yet we never really consider the risks because we love what we do, we feel confident in our ability or we just don't even think about them. As many of you know I have been harping on about mandatory safety gear for years, and every run I put on in the Alps or in winter people ask—“Do we need to carry all that gear” and I say “Yes” and enter into a lengthy explanation. In recent years having had a couple of runs in really bad weather I have questioned whether in fact my list is actually too small and in fact are we becoming too blase and complacent, not only in events but also in our training runs. Trail Runner (July 2016/Issue 113 from the USA) recently wrote that since 2008 over 10 runners have died undertaking trail runs in the mountains, some as short as 10 miles and others as long as 100 miles, most from hypothermia or falling off cliffs in bad weather. Two died in a 10 mile race in the mountains in Germany in a freak snowstorm only minutes from the finish. The following year 3 runners died of hypothermia in France after slipping down a slope and then in 2012 and 2013 two runners died in Spain and the UK when the course was plagued by high winds and freezing rain. Most of these cases sparked emotional debates about where responsibility lies when a runner succumbs to the elements during an organised race. Though organised runs/races may create the illusion of a safer environment than a solo runner in the bush, they also carry additional risks— sometimes causing people to venture out in dangerous conditions that they might have avoided on their own. The truth is that none of us—no matter how experienced or fit or strong—is immune from scenarios that, if experienced in the wrong place at the wrong time, could prove life threatening. We need to step back and consider our gear—have we got what we would need to be comfortable/survive if we were caught out in bad weather for 6 - 12 hours with a sprained ankle or worse. Everyone is focused on the smallest lightest pack and gear—but ultimately is it the right gear? Some food for thought, after all it’s your life. 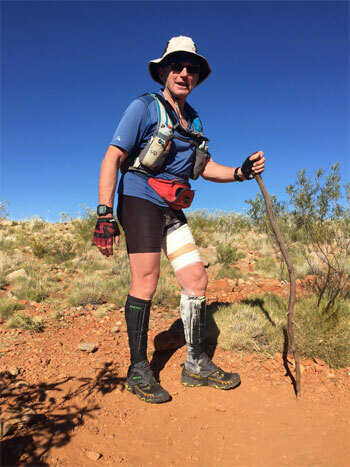 This injury on the Larapinta Trail was a torn tendon that required a 15 km walk out and follow up surgery.